6 Are Published Reserve Figures Overstated? Perhaps no question has more relevance to strategies for dealing with the global warming crisis than the distribution and quantity of coal available for future mining. Compared to elusive petroleum deposits, coal deposits are easily found and measured. What makes the problem tricky is the huge difference between the amount of coal in the ground and the amount of coal that will ultimately be mined, assuming constraints ranging from physical barriers to technological limitations to environmental regulations. As Table 1 shows, even in the comparatively well-studied United States, the exact definition of reserves and resources results in a 200-fold difference between U.S. estimates of "total resources" (4,000 billion short tons) and "recoverable reserves at active mines" (19 billion short tons). Every three years, the World Energy Council (WEC) publishes its Survey of Energy Resources, of which the most recent edition was released in 2010. The WEC's survey is widely used and is the basis for estimates by the International Energy Agency (World Energy Outlook), the U.S. Energy Information Administration (International Energy Outlook), and British Petroleum (Statistical Review of World Energy). Definitions of coal reserves vary from one country to the next. The U.S. Geological Survey defines coal resources as "naturally occuring deposts in such forms and amounts that economic extraction is currently or potentially feasible.". USGS defines coal reserves as "the part of the coal resource that can be mined economically, at the present time, given existing environmental, legal, and technological constraints." Other countries use different definitions. The Gillette field in the Powder River Basin coal region of Wyoming is the world's most productive coal mining area. In 2006 it produced 431 million tons of coal, or 37 percent of total United States production. 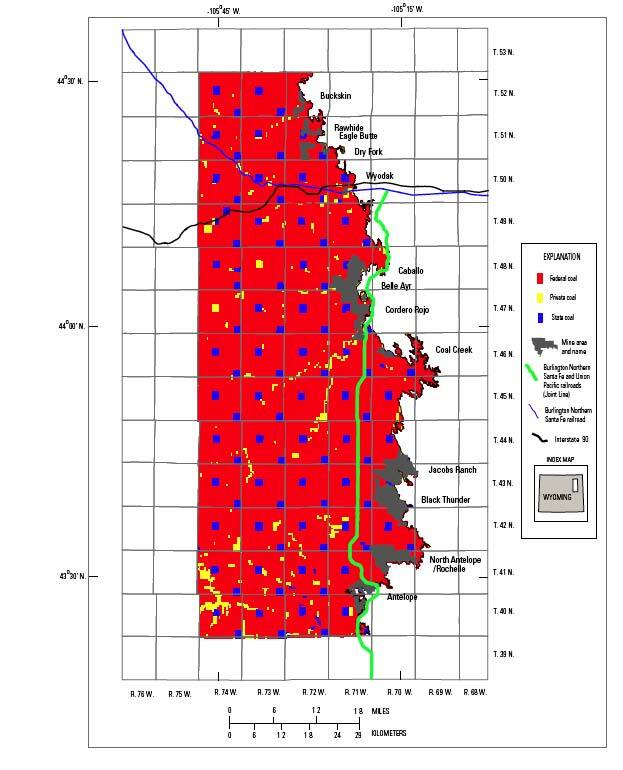 In 2008 the U.S. Geological Survey released a detailed assessment of the coal resource in the Gillette field. USGS concluded that the portion of the recoverable coal that can be mined, processed, and marketed at a profit, based on conditions in 2007, including $10.47 per ton and assuming an 8 percent rate of return, is 10.1 billion short tons for the six coal beds evaluated. This is about half the estimate arrived at by a 2002 study of the same field, which arrived at an economically recoverable resource of 23 billion short tons. However, if the price of coal is assumed to be $14.00 per ton, matching the sales price of coal for the Gillette coalfield as of March 2008, the reserve would be 18.5 billion short tons, assuming no increase from 2007 operating costs. If cost per ton rose to $60, the estimated reserve would rise to 77 billion short tons. Are Published Reserve Figures Overstated? Several analyses of coal reserves have concluded that published figures are too high. Germany: In 2004, without explanation, Germany downgraded its estimate of proven hard coal reserves from 23 billion tons to 0.183 billion tons, a 99 percent reduction. United Kingdom: The "proved recoverable coal reserves" were of the United Kingdom were reported at 45 billion tons in 1980. In 2004 the figure was reduced to 0.22 billion tons, a 99+ percent reduction. Botswana: In 1980 Botswana reported 3.5 billions tons of "proved recoverable reserves." In the WEC 2004 Survey the "proved recoverable reserves" were lowered to 40 million tons, a 99 percent reduction. Another problem was that published figures had not been revised to account for production over time. For example, China's official coal reserve figures have not been revised since in 1992, "in spite of the fact that about 20 percent of their then stated reserves have been produced since then." Only two countries have increased their reserve estimates: India, from 12.6 billion tons of hard coal in 1987 to 90 billion tons in 2005, and Australia, from 29.1 billion tons of hard coal in 1987 to 38.6 billion tons in 2005. The study predicted that "global coal production may still increase over the next 10 to 15 years by about 30 percent, mainly driven by Australia, China, the Former Soviet Union countries (Russia, Ukraine, Kazakhstan) and South Africa. Production will then reach a plateau and will eventually decline thereafter." Peak production would occur around 2025 and would fall to roughly half the current level by the end of the century. Normally it is argued that reserves are part of the resources. Over time and with coal prices increasing more and more resources will be converted into recoverable reserves. This suggests the analogy to an iceberg of which only the tip is visible whereas 90% are under water. However, as detailed in Annex 1, the present and past practice of reserve reporting does not support that view. Many countries have not reassessed their reserves for a long time, and if so, revisions have been mostly downward instead of upward, contrary to what should be expected. Dave Rutledge: In 2007, CalTech professor Dave Rutledge made an independent analysis of ultimate coal output based on a technique borrowed from "peak oil" analysis known as Hubbert Linearization. Like Energy Watch Group, Rutledge concluded that published coal reserve figures are significantly overstated. As of the end of 2005, Rutledge projected future coal use of 382 billion metric tons (Gt), compared to a World Energy Council "recoverable reserves" figure of 847.5 Gt. Patzek/Croft Study: In a peer-reviewed article published in the journal Energy, two researchers - Tadeusz Patzek, a University of Texas engineering professor, and Greg Croft, a St. Mary's College of California earth science professor - write that the world will hit "peak coal" production in 2011 or shortly thereafter, and then mining would begin a long, steep decline. The authors believe the 7 billion tons of coal the world is now mining and burning each year is as high as it can get, due to harder to reach coal reserves and rising demand. The study was funded through a University of California, Berkeley graduate student fellowship. The pair's prediction is based on the "Hubbert Cycle," the resource-depletion theory that American geophysicist M. King Hubbert used in the 1950s to correctly forecast that U.S. oil production would peak two decades later. Patzek predicts coal will peak not because supplies are running out but because the remaining deposits are increasingly difficult to mine. Alaska's North Slope, for example, has coal reserves that rival those of the continental United States, but turning that coal into energy would be practically impossible, Patzek argues: "It would take 10 or 11 of the largest coal terminals on the Earth operating 24-7, 365 to load ships above the Arctic Circle during the polar night." Russia, China and other energy consumers face similar logistical difficulties with coal, and while global supplies are set to trail off, the stage is set for demand to spike, Patzek said. U.S. consumers use slightly less than 1 billion tons of coal annually, the Chinese use an estimated 3.5 billion tons, and emerging energy giants like India and Indonesia are steadily using more. Patzek and Croft's peak-coal prediction is being contradicted by government economists and industry groups. The federal Energy Information Agency estimates the United States alone has about 260 billion tons of recoverable coal, enough to support current consumption levels for at least two centuries, said George Warholic, an EIA coal economist. And the National Mining Association said the United States is sitting on enough recoverable coal to power the country for the next 440 years. The researchers and agencies are making forecasts using different methodologies. The Hubbert cycle analysis looks at past production trends to predict future results. EIA and the mining trade group prefer to measure current consumption rates against estimated future reserves. Jerry Taylor, a resource economist and senior fellow at the libertarian CATO Institute said much of the disparity comes because there are too many variables contributing to coal production to make precise predictions. New mining technology could boost production by making previously untouchable reserves cheap to recover, Taylor said. Alternatively, coal production would drop if an influx of cheap oil and natural gas curbed demand, he said, pointing to the boost in natural gas drilling due to hydraulic fracturing. The researchers are also skeptical about emissions from burning fossil fuels causing catastrophic climate change: they accept the science connecting human greenhouse gas emissions to global warming, but think the remaining accessible fossil fuel stores only contain enough carbon to raise global temperatures by about 0.8 degrees Celsius, said Croft. (It should be noted that the scientific consensus is the earth has already warmed 1 degree Celsius, and many climate scientists like James Hansen believe any additional increase could set into motions feedbacks toward warming beyond human control.) Therefore, Croft said, he advocates not a cap-and-trade law for carbon emissions and investment in carbon capture and storage, but instead incentives for renewable energy and possibly a carbon tax to promote efficiency. Barbara Freese, a senior coal policy analyst for the Union of Concerned Scientists, said she could not judge whether the peak-coal prediction was accurate without more analysis but that the study should prompt policymakers to question some of their assumptions about the fossil fuel: "We spend a lot of time talking about whether we can rely on renewables and efficiency and whether that's practical and affordable, but we've kind of given a pass to coal proponents. We need to see evidence that we have the economically recoverable reserves." Absolute fossil fuel scarcity at the global level is not a significant factor in considering climate change mitigation. Conventional oil production will eventually peak, but it is uncertain exactly when and what the repercussions will be. The energy in conventional natural gas is more abundant than in conventional oil but, like oil, is not distributed evenly around the globe. In the future, lack of security of oil and gas supplies for consuming nations may drive a shift to coal, nuclear power and/or renewable energy. There is also a trend towards more efficient and convenient energy carriers (electricity, and liquid and gaseous fuels) instead of solids (high agreement, much evidence) [4.3.1]. According to Dave Rutledge's analysis, the IPCC scenarios assume levels of coal far higher than actually will be mined. For example, the IPCC maximum scenario depends on an ultimate coal usage (past production plus projected future production) of 3,400 billion metric tons (Gt), compared to 663 Gt projected by the analysis. An implication of the suggestions that coal reserves are significantly overstated is the possibility that depletion of coal reserves, or "peak coal," might limit the extent of potential warming caused by coal, especially if those reserves could be reduced yet further by policies to move some coal into off-limits status. Noting that the a third of U.S. coal reserves are located on federal lands, Dave Rutledge suggests that a government program aimed at sidetracking a portion of those reserves would be more effective in limiting ultimate global warming than attempting to limit annual usage of coal. Rutledge used the MAGICC climate model to assess the implications of his lower coal reserve estimates. Applied his projection of coal reserves to the MAGICC climate model, Rutledge If the Rutledge analysis is correct, then the impact of future coal usage is 0.3 degrees C. Of that total, the share attributable to future U.S. coal burning is 0.05 degree C.
A contrasting study to that done by Rutledge is a 2008 study by Pushker Kharecha and James Hansen, "Implications of 'peak oil' for atmospheric CO2 and climate." Kharecha and Hansen modeled a coal phase-out scenario in which developed countries leveled out their coal usage from 2012 to 2022, then reduced it at a straightline pace until zeroing it out in 2050. Developing countries would level their usage out in 2022 and would also zero out their usage by 2050. This coal phase-out scenario, which would release 110 Gt of carbon from coal into the atmosphere from 2007 through 2050, was then analyzed in connection with a variety of assumptions about oil and gas depletion. The peak carbon dioxide level connected to the various scenarios ranged from 428 to 446 parts per million (ppm). A "business as usual" scenario in which coal usage was not limited produced a peak carbon dioxide level of 563 ppm. The implication of the Kharecha/Hansen scenario is a climate policy that focuses heavily on coal: with the phenomenon of peak oil limiting other fossil fuel emissions, proactive limits on coal alone are sufficient to curb climate impacts below 450 ppm. Rutledge's study implies a contribution of future coal, inherently limited by "peak coal" dynamic, of 201 Gt of carbon, compared to 110 Gt of carbon for the Kharecha/Hansen coal phase-out scenario. In other words, achieving the carbon emission levels of the Kharecha/Hansen coal phase-out scenario implies that carbon emissions are 91 Gt lower than would occur under a business-as-usual continuation of trends to the present. This coal phase-out represents a 45 percent reduction (91 Gt/201 Gt) from Rutledge's projection of ultimate future coal usage. Note that neither Rutledge nor Kharecha/Hansen includes the contribution to global warming from unconventional sources such as tar sands and oil shale. Nor do they include any role for carbon capture and storage technology. Development of tar sands and oil shale would decrease the amount of "acceptable" coal use; development of carbon capture and storage would increase it. In addition, neither Rutledge nor Kharecha/Hansen analyzes scenarios that would limit carbon dioxide levels to 350 ppm, a level more recently suggested as a "safe" threshold by climate scientists. Dolly Sods Wilderness Area: In the 1970s The Nature Conservancy acquired 15,000 acres of coal rights and transferred them to the U.S. Forest Service, allowing for the creation of the 10,000 acre Dolly Sods Wilderness Area. In the early 1990s, the Conservancy acquired over 6000 acres (known as "Dolly Sods North") for the Forest Service. The Preserve was created in 2000 with the donation of 477 acres by Dominion, an energy company based in Virginia. The Conservancy also has 147 acres in conservation easements. Grand Staircase-Escalante National Monument: Established in 1996 during the Clinton administration, the Grand Staircase-Escalante National Monument in Utah effectively placed 11.375 billion tons of recoverable coal on reserve. That amount of coal is sufficient to provide a lifetime supply to 165 500-megawatt coal plants running at an 85 percent capacity factor. The group Carbon Tracker estimates that coal reserves held by companies listed on the London Stock Exchange is equivalent to 44.56 gigatonnes of CO2 owned by 16 companies; of that, around half of the coal owned by these UK-listed companies is exported to China, Russia, India and South Africa. The six companies with the most reserves are, respectively: Anglo American, Xstrata, BHP Billiton Group, Evraz Group (Russian steel producer), Bumi Plc, and Rio Tinto. Most of the reserves held (one-third) are located in Australia. The Carbon Tracker report, "Unburnable Carbon - Are the world's financial markets carrying a carbon bubble?" concludes that if the world is to achieve the internationally agreed target of limiting average temperature rises to 2°C, only a little over 20 per cent of all listed fossil fuel reserves (565 GtCO2 of the listed 2,795 GtCO2) can be burned. ↑ Survey of Energy Resources, World Energy Council 2010. ↑ Ellis, M.S., 2002, Quality of economically extractable coal beds in the Gillette coalfield as compared with other Tertiary coal beds in the Powder River Basin, Wyoming and Montana: U.S. Geological Survey Open-File Report 02-174, 16 p.
↑ "The Coal Question and Climate Change,", Dave Rutledge (text version posted on Oil Drum blog), June 25, 2007. ↑ These figures are derived by subtracting the "fits for ultimate" figures in the "Regional Fits vs Reserves" table on slide 34 of Rutledge's "Hubbert's Peak" PowerPoint presentation from the World Energy Council "Production through 2005" figures shown in Table 2 of this article. ↑ 16.0 16.1 16.2 16.3 16.4 16.5 Patrick Reis, "Study: World's 'Peak Coal' Moment Has Arrived" NY Times, Sep. 29, 2010. ↑ To convert Gt of coal to Gt of carbon, multiply by .5 metric ton of oil equivalent (toe) per metric ton of coal, then multiple by 1.05 metric ton of carbon (tC) per toe. "The Coal Question and Climate Change", Dave Rutledge (text version posted on Oil Drum blog), June 25, 2007. This page was last edited on 12 February 2013, at 05:35.